Start cleaning out the garage now for Wood Village's Cleanup Day on May 2, 2015. This Neighborhood Cleanup Event is free to Wood Village residents with a recommended donation of two canned goods per trip. The Wood Village Cleanup Day starts at 9am and will be over at 2pm, so make sure your ready to go ahead of time. 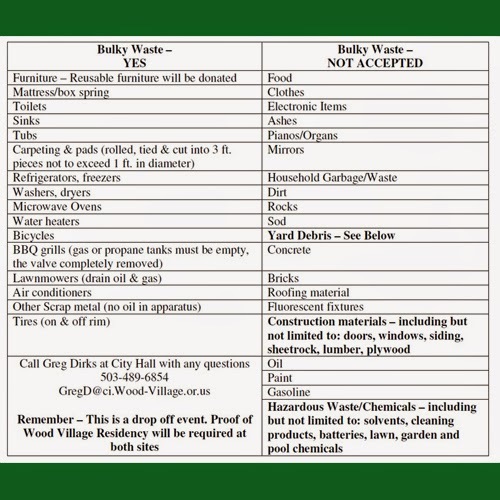 Learn details about the Wood Village Cleanup Day below and check the list of accepted and unaccepted items in the photo above. The Wood Village Cleanup Day is Saturday, May 2nd from 9am – 2pm at the Wood Village Baptist Church located 23601 NE Arata Road. This is a free event, but there is a suggested donations of 2 cans of food per trip for our SnowCap Food Drive. The following is a chart of items that are and are not accepted at the event: Proof of Wood Village residency is required at the site. There is no limit on the number of trips that can be made, but there is a limit of one truck or 8 foot trailer load per trip. Elderly or disabled assistance is available upon request.